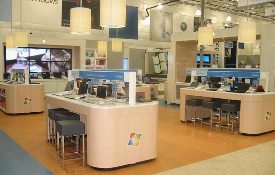 It appears that Microsoft has found yet another way to dominate the market as they are starting their own line of retail stores. Some of you are probably looking at the picture here and can’t help but compare it with Apple stores. I mean, look at the minimalist décor, and the company logo emblazed in the glass. Should we have any problem with Microsoft stealing a page from Apple’s playbook? It wouldn’t be the first time. Ooooo, that was below the belt with that cheap pot shot at Microsoft. I suppose that I could take a lot more, because a company like Microsoft is too big not to hit. So let’s get all the Microsoft cracks out of our system. Perhaps I should start out by making comparisons with the iPod and the Zune? That’s always good for some tech blog laughs. Or you want me to talk about how the Wii and PS3 will always be reigning the video game frontier in comparison to the Xbox 360, which is able to play outdated HD format movies? No, it is time to stop the hating of Microsoft by ending the ridicule. Yes, Microsoft has more money than you, deal with it. It is capitalism at work! They have a product that everyone wants, and they have made money from it. If you are sick of Microsoft jokes, and want to get them out of your system, leave a comment. As for me, I admire Microsoft’s new endeavor with my full support. By full support, I mean that I will visit them if they open up a retail outlet that is close by. I hope that each store will have the Microsoft Surface, as you can’t help but love that technology. Before Getting Into Retail, Someone Should Tell Microsoft That They Don’t Make Computers. Microsoft makes money selling OS licenses to computer builders (pro and hobbyist). They are in the license business. Dell is a computer builder. Dell buys licenses from Microsoft. Dell is not Microsoft’s “partner”. Dell is Microsoft’s customer. Microsoft is a parts supplier. hmmm, are they going to have their own line of mobile phones and computers (PCs and Laptops)? I think it would be interesting to compare microsoft products to apple’s, the iphone vs the MS-phone, and the macbook vs MS-book… or whatever they would name them. And even though the power was out and the computer unplugged the screen remained flashing…. I think this is a huge jump for Microsoft and that this is to show everyone Microsoft will not be held down and will not make another mistake. I think this challenge will help everyone to understand that Microsoft even with all the flame they get can still achieve a number of wonderful customers. As you see this take a look back at the Zune v.s iPod even though Apple held a Huge portion of the MP3 market Microsoft went for it and came out with Zune which I think is definatly comparable to the iPod if not even better do to the fact if you have a Windows based PC, a Xbox 360, another Zune, and a Windows based OS Mobile Phone they can all link together wirelessly which in my opinion is such an amazing thing almost as cool or as great as the Surface Technology. I found out about this Microsoft just now on G4 which has always gave me such great insight on all the best news from Microsoft, all I would like to say is thank you Microsoft. Thank you all for reading my review. well for microsoft this is a massive leap forward, ok ok i will say it i am a apple person but i still need a windows pc for my office stuff (including uni) and i own a iphone ipod + a wm6 HTC touch and all 2 i link together when they are plugged into my mac and windows. now i think that the workings between everything is great even wit parallels on a mac or the dare i say it, Iatcos for the windows (osx for windows) are perfect because its showing the world that they are making or helping to make all the pcs in the world a little eaiser to use and sync like my iphone and the HTC ameo. a microsoft store would be perfect in my opinion as it would sell all the microsoft products (mice, keyboards ect) all the gaming products (xbox games, pads, wheels ect) as well as all the pc products, (windows, office ect) it would be a massive help towards getting them to start working and bring more rivaly. theres one thing to remember people. with rivaly theres the possiabilty of even better and greater products. I really do think Microsoft could create it’s own OEM computer hardware. Or even make deals with the places like ATI, AMD, Intel, and many other large more known companies. Just like Apple is doing with Intel and NVIDIA. Knowing Microsoft though they will have a trick up their sleeves and they will show off something that will interest everyone out there in the computer world. Just take a look at how far the Surface has gone which many people looked at the Surface with utter dislike, but now everyone thinks the Surface is moving towards the future of computer intellegence. Please go to this link to look at Surface Tech. Just click that to see our future brought to you all by Microsoft. These new store have had a lot of hype with the fact that everyone will have at least one Surface to use by yourself. Thank you all for reading my thoughts.